If you know someone who has a bun in the oven, send them a present to congratulate them on their new baby in style. 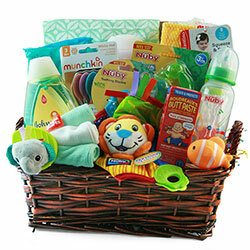 Our baby gift baskets are carefully assembled with items that parents will most appreciate when bringing home a newborn. For the baby, there are rattles, blankets, diapers, teddy bears, and more. For the parents, you’ll find gourmet treats, wine, and coffee. You can also add special optional items like Mylar balloons, new baby picture frames, or keepsake containers for baby’s first curl or tooth. These baskets are both thoughtful and practical – a perfect gift for growing families. Someone you love has found out that it’s a BOY and they couldn’t be more excited. Whether this is their first child or fourth son, this is something to celebrate. 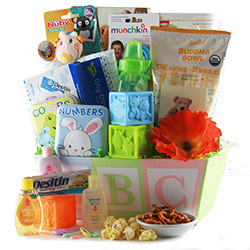 If you’re looking for the perfect gift to congratulate them, baby gift baskets are a go-to because they include a plethora of items, both practical and whimsical. 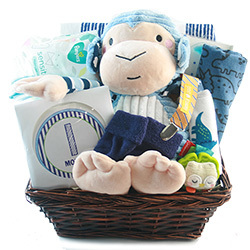 We even offer baby baskets for boys, such as the Little Monkey Baby Boy Gift Basket, which includes a plush receiving blanket, rattle, burp cloth, and cuddly blue monkey. If it’s a sweet girl that’s on the way for a friend or family member, share your excitement with the expectant parents by sending them a present that’s tailored for a little miss. Our new baby gifts for girls are ideal for parents who would appreciate something containing the everyday necessities, complemented by cute toys for their queen of hearts. 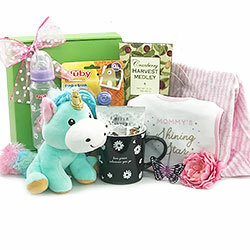 For example, the Pretty in Pink Baby Gift Basket arrives in a beautiful keepsake seagrass basket and includes a receiving blanket, a rattle, baby wipes, baby bottle, and more. The expectant parents for this little bundle of joy might need some TLC, too. Help them prepare, both practically and emotionally, with one of our gift baskets designed for adults with a new baby in the house. The Proud Parents Gift Basket is a consistent favorite with its bottle of wine (or Champagne), focaccia crisps, chocolate chip cookies, baby bib, and various other baby supplies. It’s a survival basket for both parents and child! Another popular (and apt) present you can send is the Up All Night Baby Gift Basket with K-cup coffee, coffee mug, brownie brittle, baby bib, baby bottle, and more. Throwing a shower for a mom-to-be? Or attending one and want to bring a showstopper gift? Our new baby gift baskets are ideal for showers because they check off several items from the baby registry in one fell swoop (bottles, wipes, diapers, burp clothes, and much more), but they are also colorful and festive. 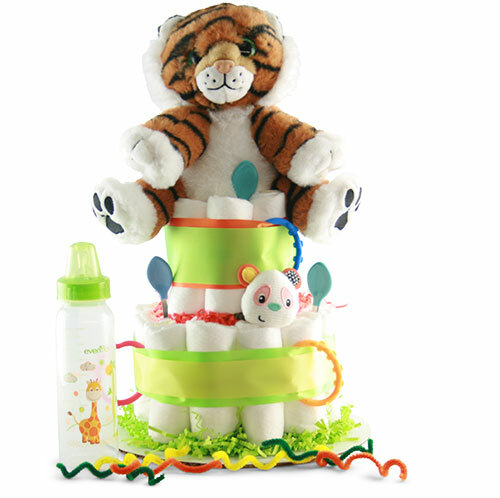 Many people use diaper cakes as décor for the gift table, or even a centerpiece for the dessert table. Bring one to the party and you’ll be sure to make the future momma happy. 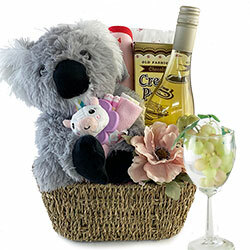 If this is too special of an occasion for you to let pass by without adding your personal touch, you can create your own Custom Baby Gift Basket. With our simple online process, it’s easy to build a personalized basket for the baby boy or baby girl who’s soon to be here. 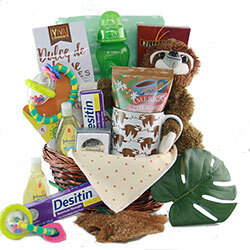 Designing your custom baby basket starts with selecting the gift basket budget and container type. Then select baby products from several different categories and Viola! We’ve gone to great lengths to ensure that only the finest quality selections go into our very exceptional gift baskets! Plus, you can include optional items like balloons, stuffed animals and picture frames to further personalize your baby basket.